Can sedimentation analysis contribute to the protein folding problem? Protein folding is a spontaneous reaction commonly modeled by in vitro reconstitution experiments. 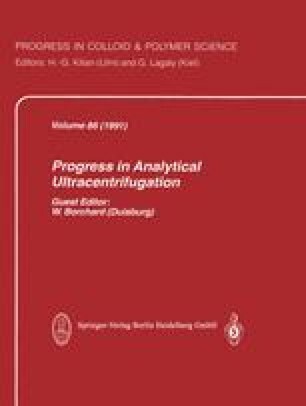 Ultracentifugal analysis may be applied to characterize the initial, intermediate, and final states in the denaturation-renaturation cycle. With respect to intermediate states, the “molten globule state” and the “A-state” are considered to be of major importance. Using α-lactalbumin, lactate dehydrogenase, γII-crystallin and immunoglobulin as examples, compact intermediates observed at low pH may be analyzed by ultracentrifugation. Correcting for changes in the partial specific volume, and considering aggregation as a side reaction, previous conclusions regarding the increase in hydrodynamic radius of α-lactalbumin at pH 2 are questionable. In the case of lactate dehydrogenase, subunit dissociation and charge effects on the partial specific volume are superimposed in the sedimentation characteristics at low pH. s-values and reactivation kinetics prove that the enzyme in its “A-state” consists of “structured monomers” with significant residual structure. γII-crystallin is exceptional in that it shows long-term stability even at pH 1. Addition of chaotropic agents, e.g., urea leads to sequential unfolding of its two domains. Immunoglobulin at low pH forms an “alternatively folded state” with residual secondary and tertiary structure. Cooperative reversible thermal transitions prove this state to be qualitatively different from the “molten globule”. Ultracentrifugal analysis allows the spectral and calorimetric data to be interpreted in structural terms.